Smooth Gameplay: The main design goal for «Robina’s Rescue» is to be a straightforward 3D platformer where the focus is on smooth gameplay, where the game’s speed naturally will follow the player’s speed. 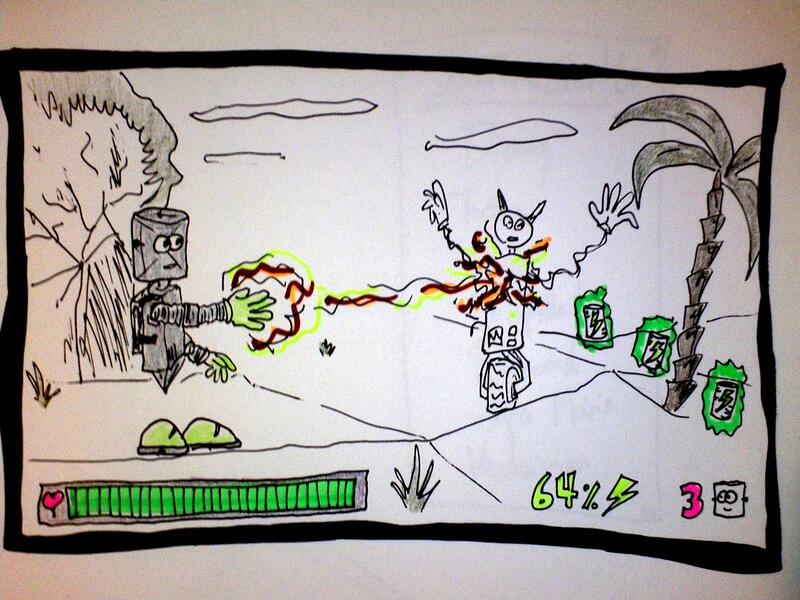 For example, one player might never really use Robob’s rocketpack because he would feel it was too speedy and uncontrollable, while another player might choose to use it almost all the time and thus be able to run through the level at a fast pace (because, yes, there will be enough energy-cans laying around to have fun). Plug’n’Play: This should be a game you could just pick up and play, and then start playing at the exact same place you were at last time. Plain Fun: The last main goal for this game is that it should be fun and relatively hazzle-free. With Robob’s jetpack and his ability to blast his enemies with electric shock it will be an enjoyable experience with enough freedom to keep the player engaged throughout the game. Playstation 3, Xbox 360, Wii, iPad and other pads, and a «low-res» version available on Android and iPhone. The game is set in a fictitious reality called RoboWorld, which is a world like ours full of natural resources, but where all the sentient beings are machines that somehow evolved there. 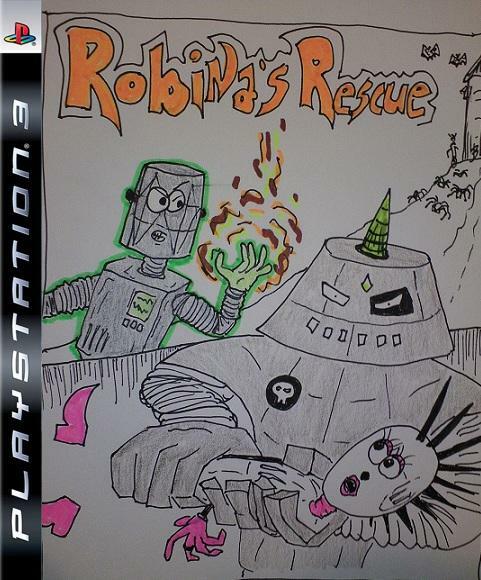 The soon-to-be Queen of RoboWorld, Robina, is captured by the evil Roboroth. He picks her apart and places the pieces of her body in six different locations around RoboWorld, while holding on to the DNA-battery-capsule that energizes her robobody at his own place. The battery capsule will transform and contain almost eternal energy once the time comes for Robina to be queen. RoboWorld’s only hope lies with Robob, who’s the one to gather and re-assemble her bodyparts before it’s too late. The game (and the story) begins with a scene where we see Princess Robina in her own room, looking in the mirror and thinking about becoming the next Queen in just a few weeks. We, the player, get to know that in RoboWorld, when a princess becomes a queen, her DNA-battery-capsule initiates «The Queen Program», which means it will download almost limitless energy into the new queen in order for her to be able to rule the Queendom properly. The queen mustn’t run out of energy, and gets almost no periods of recharging (which is what robots do instead of sleeping). Robina reacts quickly, as any soon-to-be-queen should, and throws her chair at one of the attackers. The other one jumps over it and lightning fast grabs Robina’s throat with his giant clawlike hands. Robina tries to push him into the wall, but fails as the first one snatches her feet. «Let’s get outta here, Swarmbro’!» They disappear out the window again, with Robina held screaming between them. The next thing we see is a scene from somewhere else – perhaps a garage. 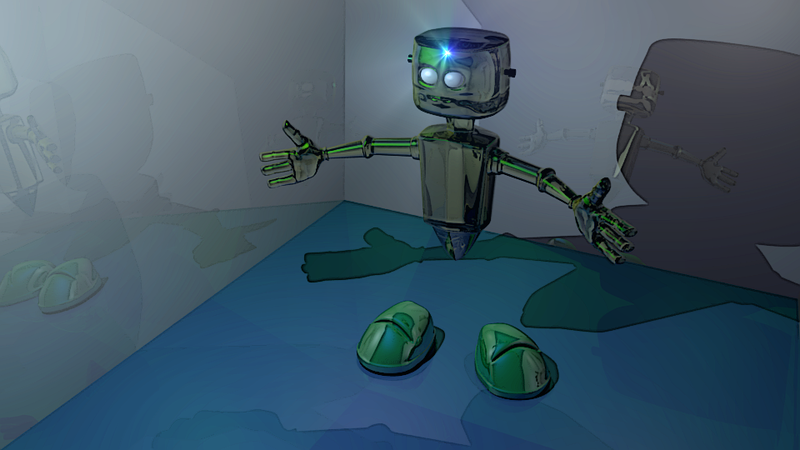 Here we get the first look at Robob, which is the main character and the game’s hero. 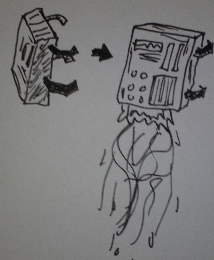 He’s repairing some old machine and has his head and upper body stuck underneath it when a messenger from The High Queen’s Palace suddenly shows up from nowhere. 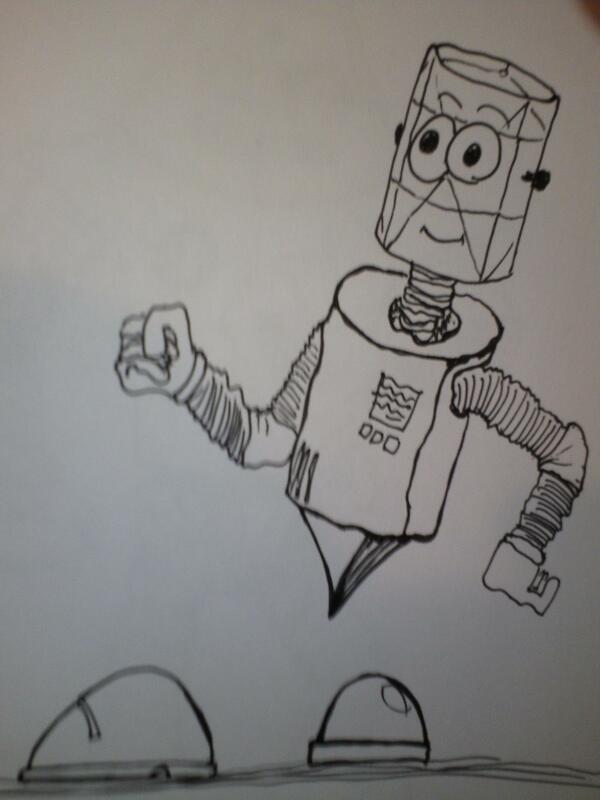 «Oh, yea, right,» the messenger says, «our technicians were able to download Robina’s consciousness from the RoboNet and into this CommuniPack in order for you to communicate with her.» He hands Robob the CommuniPack. «Put it on when you’re ready, and Robina will be available – like talking to her on a phone. She knows through her artificial attachment to the body where the different parts are hidden, and so she will show you the way.» The messenger stops to regain his breath. «Cool,» Robob says and pushes a few buttons on the CommuniPack in order to turn it on. «I’ll get right on it. You can tell the Queen I’ll drop by the palace when Robina’s safe again.» He smiles. The messenger looks a bit confused because of Robob’s calm, joking and kind of unserious attitude towards this great horror, but he accepts it because he knows that Robob is totally freakin’ awesome. The screen turns black again, and the next time it lights back up, we’re in the game’s main level, the World Level where one accesses the other mini-worlds. We can call the segments these mini-worlds consists of «action levels» since this is where the action happens and the bodyparts are retrieved. So, we find ourselves in RoboWorld at Robob’s garage, ready to go. 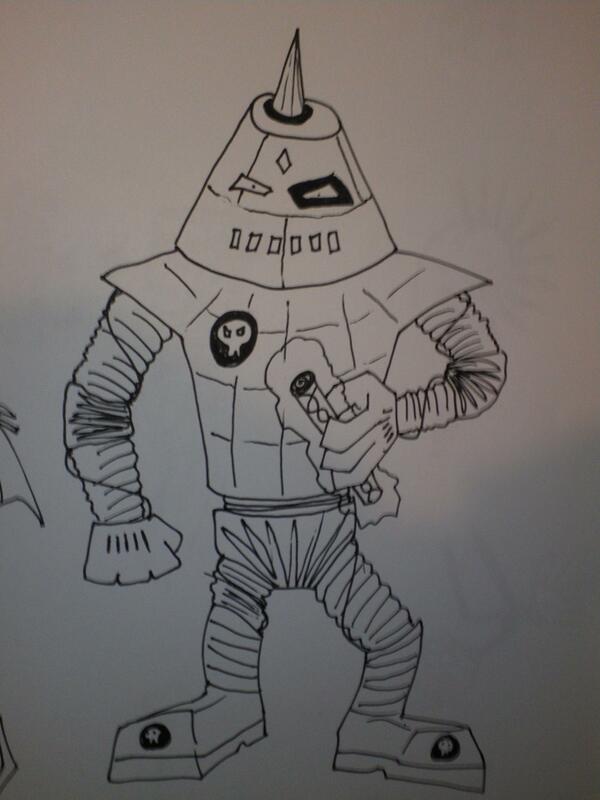 Here Robob is equipped with the CommuniPack, and the first thing to happen is we hear Robina’s voice introduce herself. 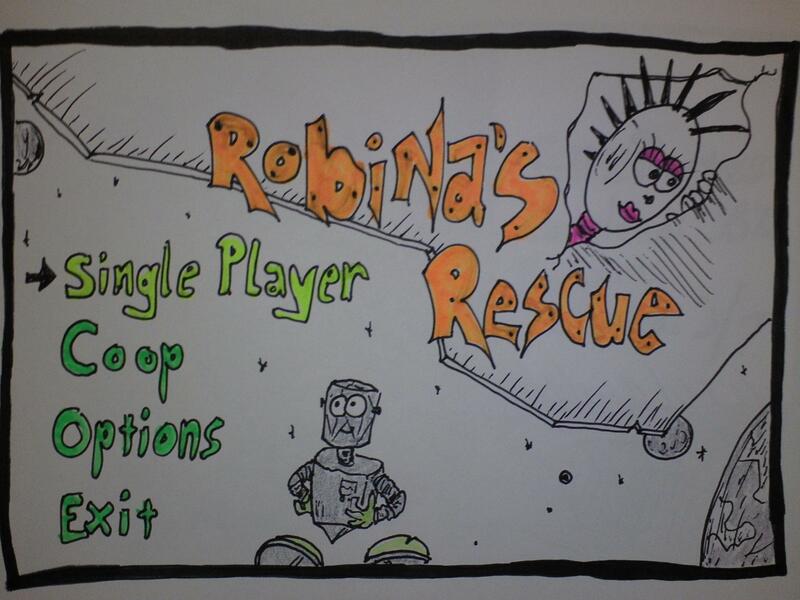 Robob answers and they chit-chat a little bit about what’s happened, and then Robina continues to teach the player how to maneuver the character around the screen in a few tiny introductory «challenges». 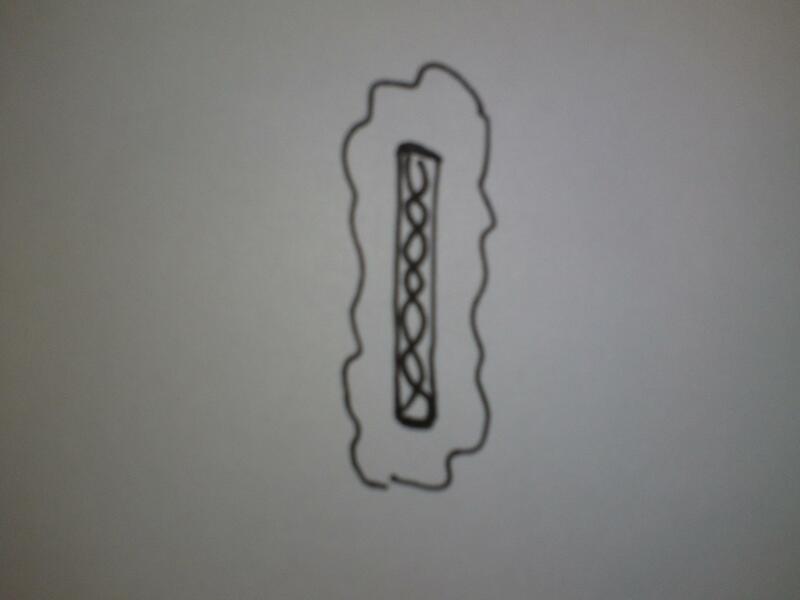 After, if the player doesn’t want to do it again, he is then lead to the entrance of the area where the first level takes place. From this point on the player will play through each of the seven mini-worlds within RoboWorld. Each world includes three levels – two action levels and a boss fight. After a boss is defeated Robob will get access to one of Robina’s bodyparts. The player must then exit that particular world and enter back into the World Level and visit his garage to store the newly found bodypart. After every boss-fight Robina’s body is more fully restored, until Robob goes back the last time after winning the DNA-battery-capsule back from Roboroth (which surely is the last, biggest, and baddest boss in the entire game). 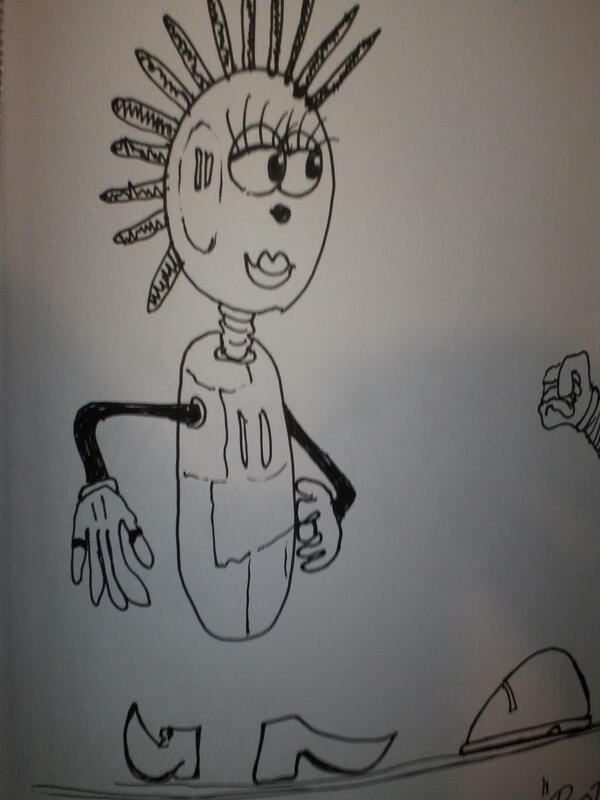 When every piece of Robina has been restored and she’s back in her body, she will be transformed into queen, and Robob will be, as a heartwarming thanks, welcomed to marry her and become the king of RoboWorld. Which he is very pleased to hear, and happily accepts the offer. Some of Roboroth’s RoboSwarm soldiers. The plotline begins with Robina being taken and then Robob being recruited to the mission. 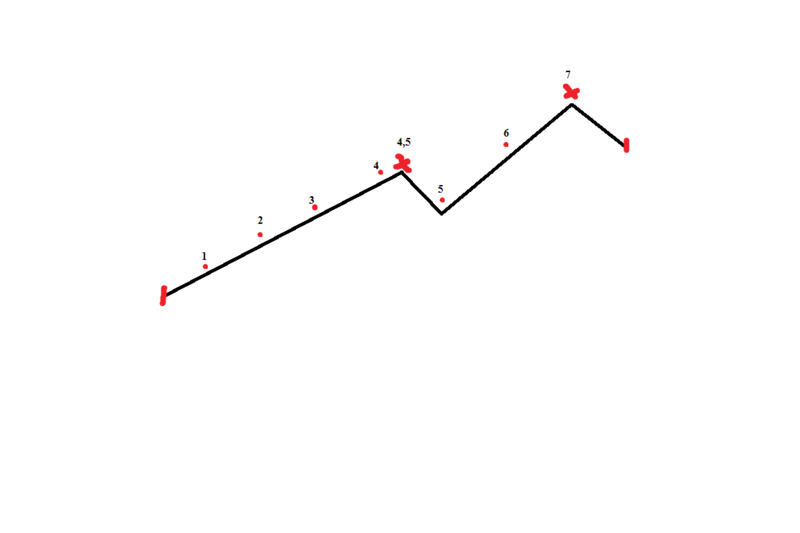 Then the game (first world and first action level) begins, which is signified by the number 1 on the plotline. The game slowly becomes harder and more intense as the player plows her way up through the different mini-worlds within RoboWorld, until boss fight number 4 is done and Robob is on his way back to install the newest bodypart. This is where the red X and number 4,5 on the plotline happens, which is a sort of surprise moment in the game because it somewhat breaks the natural flow the player has gotten used to by now. So what happens is that as Robob sees his garage, he can see a whole bunch of RoboSwarm soldiers breaking in at his place. Surely he understands their motives of re-capturing the bodyparts. 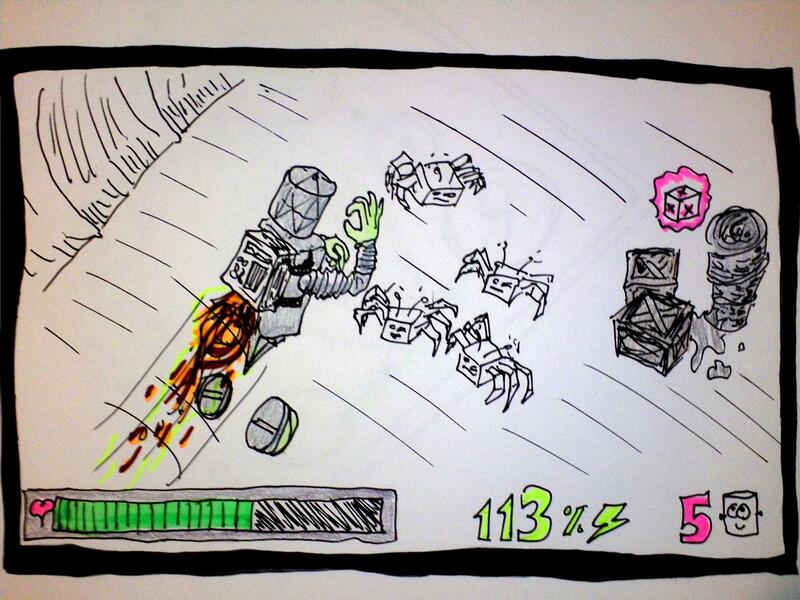 Robob runs into them and the player must defeat loads of enemies before the threat is terminated. 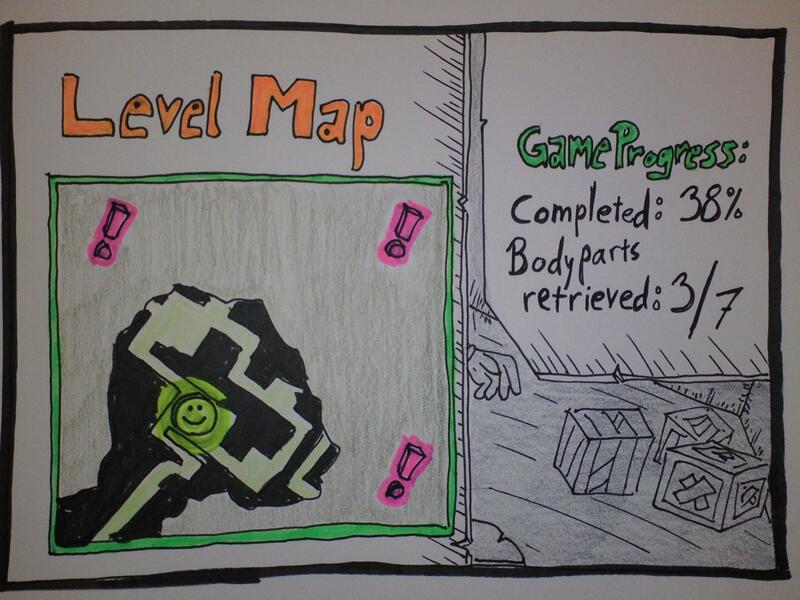 It will be a pretty hectic experience for the player, and by the time the «level» is finished, he probably doesn’t wish for another such experience. Therefore, when the player completes this part, he is rewarded with a much easier 5th world, where the only real challenge is the boss. 6 and 7 will clearly be the most difficult worlds, culminating in the final boss. After Roboroth is killed the player can enjoy a few animated scenes where Robob takes the last piece to his garage and installs it in Robina’s body. She then transfers her consciousness back into the body. The next, and last, scene is back within the boundaries of The High Queen’s Palace, where we get to witness Robina’s transformation into a queen, and wants to marry Robob. 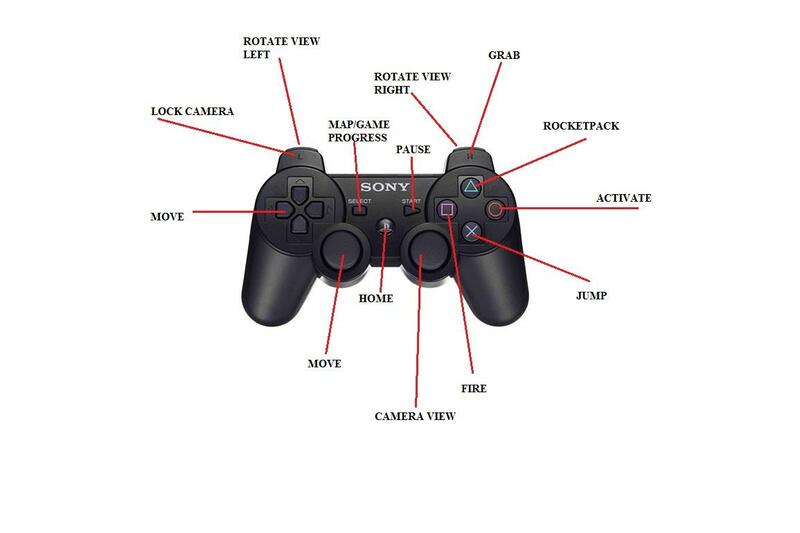 Apply the controls you saw a paragraph or so above this to what you see on these screenshots, and then imagine that this is a 3D level where you can move the camera view however you like. 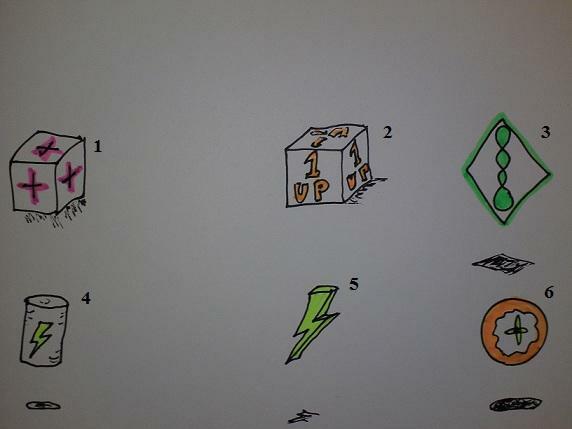 Then include the understanding that those little things resembling soda cans (with the lightning symbol on) is called «Energy-Cans», and is what Robob needs to keep having enough energy available to blast enemies with electric shock or use his rocketpack. You know how much energy you have by looking at the percentage level shown where the lightning symbol is, on the bottom of the screen. Right next to it you see a little Robob head, and a number – this is intuitively known as how many lives you have. And, of course, the «heart bar» on the left bottom side is your life. On the screenshot beneath, where Robob is flying himself over a few RoboCrabs with his jetpack, you can see an example of what a health crate looks like on the right side of the screen. 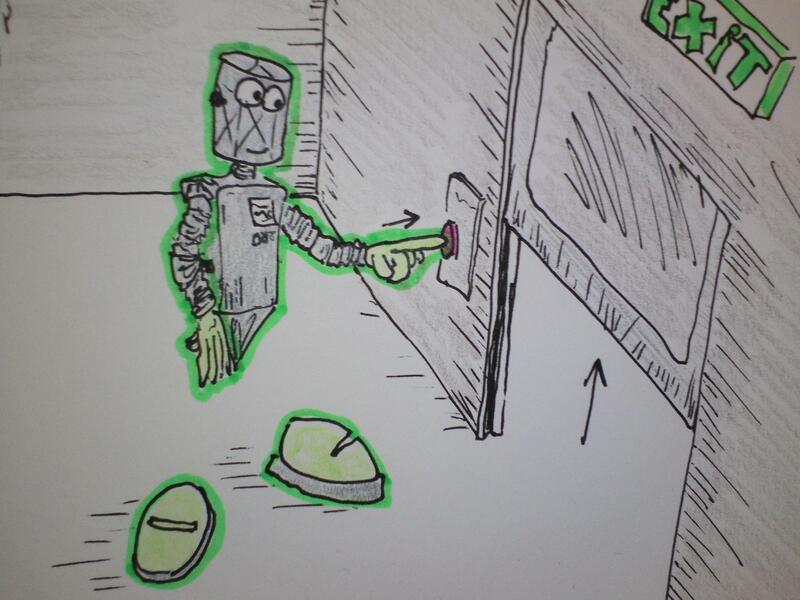 What we also can see in the picture above is what it looks like when Robob opens a door, using the activation button. 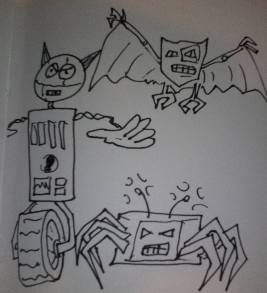 Here we see a sketch of the entire RoboWorld as it’s viewed from a bird’s perspective. Within the boundaries of this world we see how the different mini-world’s are placed relative to each other. Within each mini-world the player must complete two action levels and a boss fight before being allowed to move on to the next chapter. From the title screen the player can choose «Single Player», where she will get the option to «Create New Game» or, if available, «Load Previous Game». These two options will also be available if one chooses «Coop» on the title screen, only here it’s a two-player version of the game. [The two player version is the same as single player, only with split-screen, and both players controls their own Robob with different colors. The cutscenes will still only feature one Robob, and thus will be completely identical to the Single Player mode.] The player can also go to «Options» which will include the following: «Control Setup», «Sound and FX», and «General» which includes «Game Difficulty», «Invert X axis», «Invert Y axis», «Screen Brightness», «Subtitles». At last there’s the «Exit», which (hopefully) everyone knows what is and does. It should make immediate sense to anyone who’s ever played more than four or five games. In «Robina’s Rescue» one is able to save the game anywhere, anywhen and it literally saves the game exactly where you are. You also have the ability to load into another saved game if you don’t like the way you’re headed in your current game. The «Options» option contains the same information and choices as «Options» on the Title Screen. «Exit Level» means leaving that particular action level, and entering back into the World Level. This screen should also be pretty easy to understand. The map, as you may see, is not revealed in its entirety right away. The player must walk around to be able to see more of the landscape. However, every level has its own significant places where Robob needs to activate something, get a key to open a door, or simply finding the exit – and these places are seen as the flashy «!» visible even in the undiscovered places of the map. This game is mainly for kids and old grandmothers, and so we don’t want them to be totally lost. Notice that both in the «Game Paused» and the «Level Map/Game Progress» screen, the game screen is still visible behind the information. But to enhance the effective and clear communication of the different screens’ information, the game screen behind has lost all its colors to a single greyish one, which indicates that the game is stopped. In any given level there will be three types of audio required: Music and atmos sounds for all the worlds, levels and cutscenes. Plus sound effects and voice-acting for all the characters. Robob must have a great variety of sounds and small spoken sentences he says sporadically while playing. 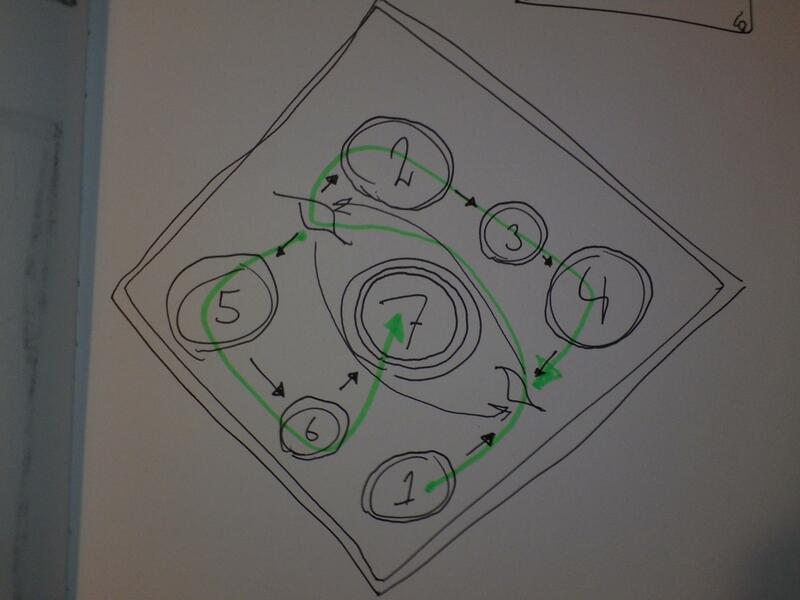 1: The conceptualization phase of the game is done, and everything is ready for action. 2: Modeling and texturing of every character, level, building, item and world finished. 3: Animation of everything is done, plus finishing the game’s cutscenes. 4: Every element in the game is imported into the game engine, and every level is set-up. 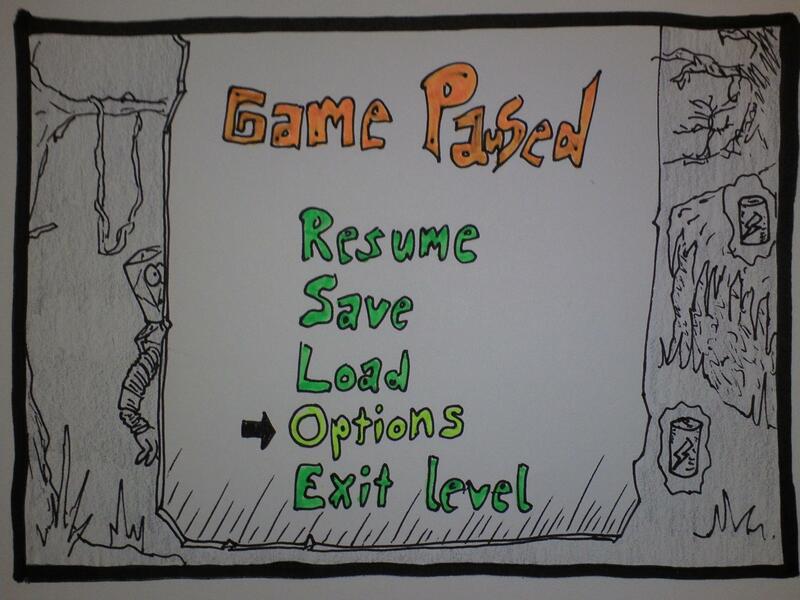 5: User interfaces and menus, AI, and general game mechanics completed. 6: Voice-acting, music, foley, atmos and sound effects all implemented in the game. 7: This milestone is in three parts: alpha testing, closed and open beta-testing. 8: Everything is completed perfectly and the game is ready for it’s awesome release! Have extra computers, external hard-drives, etc.! Make sure to be in contact with people who are able to fix the given software. – People «anomalies» such as sickness, injury, child birth, quit job, get fired. These can’t really be avoided in any real controled manner – except for maybe making sure the work environment is a pleasant and inspiring as possible. Yet, life is uncertain. – Miscalculation of time and money estimates. Both time and money may change throughout the course of the game development, and so the only thing we really can do is make appropriate safety measures and hope that they will be reflected in the real life process. – Other random events like fire, robbery, earth quakes, floods, storms, doomsday (lol), etc. Except from having the right insurances and staying awake and vigilant, there’s probably not a lot anyone can do about these risks. In order to be comparable worldwide the currency used here is US dollars. Some of the calculations have been rounded up to the closest whole number in order to keep the budget clean looking and always on the safe side. The budget is the total costs of a year’s (twelve months) worth of game development. The staff’s salaries is based on what I’ve read around the Internet, and then reduced the payments a bit because this is mainly meant to be an indie project. Their yearly income was calculated like this: 8 hours work a day x 5 days a week x 50 weeks a year = 2000 hours a year. «Cheap Version»: The first version is considered the «cheap» version meant for a newly started indie company with little monetary power. Here the software used to create the game is Blender, which is free to use both non-commercially and commercially. In this version the art and texture/material designer uses the free photo and painting program GIMP. The only software in this version of the budget that does cost money is licenses for CrazyBump, plus buying ProTools 10 for the sound designer/music composer. «Expensive version»: The second and «expensive» version of the budget is identical to the first version, except for the fact that this time no free software is used. For the creation of the game the following are: 3D Studio Max, Mudbox, Photoshop CS5 Extended, and Unreal Development Kit. Thus, this is the version of the budget a big gaming company might want to use (or a company that wants to skip the indie-phase and just jump right into the pool with the big fish). As we can see, by choosing to use the non-free software like Max and Photoshop, the total price increased with $ 78590, and this is without the money Epic wants from the use of UDK. Funding will most likely be very important, unless everyone involved is completely okay with having both a day job and also consistently working with the game on the side. The funding might come from wherever possible actually. Good places to start might be places like Indie-fund.com, kickstarter.com, and 8-bitfunding.com. Later, when the alpha version of the game is done, we could include Alphafunding, which is a possibility for others to play the alphaversion and then donate as much as they want to the good cause of making sure the developers can get the game finished. Further, the story itself is simply the old «Hero save Girl from Evil»-story dressed up in my own flavours, one could say. Anyway, I enjoyed creating my own version of this old cliché.